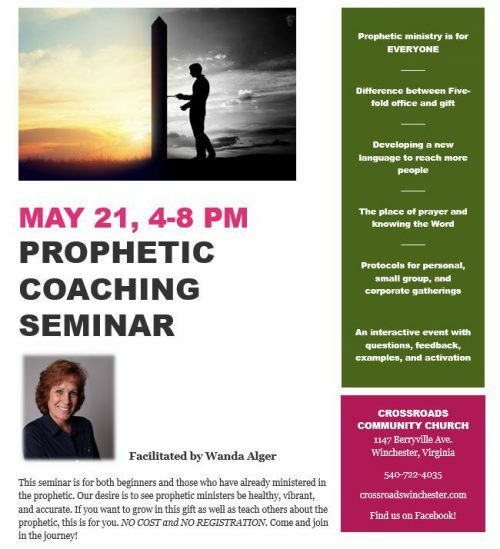 For those within driving distance of Winchester, Virginia, I’d like to invite you to join me for a special Prophetic Coaching Seminar we are hosting here at Crossroads Community Church on Sunday, May 21 from 4-8 p.m. There’s no charge and no registration. This 3-minute video tells you what it’s about and we encourage you to come! We will not be live-streaming this, but we will be taping it for those who would like to purchase a DVD set later. Once it’s available, I will post it on my blog and our church website. I will also post video highlights on our YouTube channel the week following (CLICK HERE to find our YouTube channel). PASS THE WORD!